The Microsoft Windows 10 update forces Internet Explorer 11 to your system. Unfortunately, there is no way to prevent this from happening if you use Windows 10. If you are experiencing problems visiting websites or web-applications in IE11 because of compatibility issues, utilize the Compatibility View feature in IE. If you don’t want IE11 on your system at all, you can uninstall it. Be aware that you cannot use IE10 on Windows 10 though. There is no way to make IE10 or lower versions work on Windows 10. 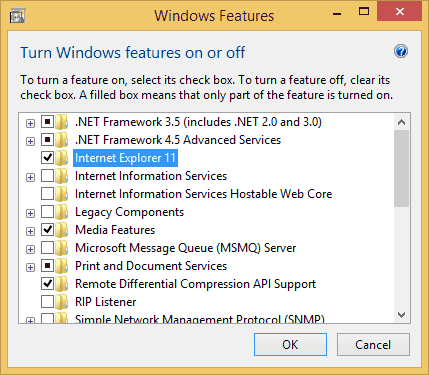 To uninstall IE11, follow these steps. Select “Turn Windows features on or off“. Uncheck “Internet Explorer 11“, then click “OK“. Select “Yes” on the warning about Turning off Internet Explorer 11. The removal process will start after these steps and you will be prompted to restart the computer. Once restarted, there will be no versions of Internet Explorer installed on the system. If you ever decide you want IE 11 back on your system, simply access this same screen again and check then box. Would this be the same instructions to DELETE, not disable the horrible EDGE & the so “90’s” Internet Explorer. I haven’t used either since Google Chrome was available. .I’m still pissed over the way MS kickfuckedeveryone to the top. Still, after all these years, I’m stuck with, sick over and tired of being slammed with all MS’s BS – please help! Hi. As far as I can tell, no matter WHAT you do, you CANNOT fully delete Internet Explorer from your PC. I tried what you’re saying above, and unchecking that box, etc., etc. doesn’t delete all files. The Internet Explorer folder still remains, with files in it, and you CANNOT change permissions to be able to delete files/folder as an Administrator. If anyone does know how to do this, please let me know. Thank you! Did this before finding this page. Needless to say, it did not help me with my issue. Specifically Internet explorer and windows update windows will close immediately after opening. Unfortunately a lot of people confuse Internet Explorer with Edge. To remove Edge requires more sophisticated work, I’ve been testing the results and so far so good. If you download PSTOOLS and run cmd as administrator then run pstools /s /i /d cmd to open a new cmd as system you can delete the Edge folder in C:\windows\systemapps and make systemapps “read only” so it can’t be recovered by updates. You can use this method to blow-away a lot of Windows10 features it seems, I’ve gotten rid of Store, Mail, all the Windows Apps, etc. Those still unable to uninstall the planet’s worst browser must click ‘OK’ after checking the box for IE, it will uninstall immediately after that. Checking the box alone is not enough. My daughter just bought a windows 10 laptop and it has the IE 11 edge program. I have followed your instructions by going to control panel clicking on programs, then turn off on windows but it is not listed in the windows turn on off options in control panel. What can I do to disable or uninstall IE 11 edge from her system? She prefers to use Chrome so I installed Chrome on her system and I was able to switch Chrome to the default browser but IE 11 is still bogging down her system. I’m trying to turn off IE 11, using Windows 10. “Turn Windows features on or off“ is not listed in my Programs and Features panel via Control Panel. I cannot change the LAN settings on my machine and thought deleting and reinstalling IE would help. in my window features, it is unchecked. But is still auto showing some sites. I’m having a problem with flash player not working in IE 11 in windows 10. Any suggestions? We tried this and nothing happened. IE11 is still doing stuff and its still there like i never unchecked it from “windows and features on or off” it doesnt show up anywhere to uninstall it either. I can’t figure out how to uninstall IE. It isn’t in the list of things on the laptop’s uninstall programs. I also tried to use a downloaded uninstall application and it wasn’t on there either. I don’t know where else to look or what else to try. I can’t use IE because it is telling me that I’m not connected to the internet. This is beyond frustrating. @Nadeem disabling IE11 does not uninstall it. IE11 is prevented from running on your machine. If you actually read the article on this page before leaving a comment you will see that it is not possible to install IE10 if you are using Windows 10! @Lea Documents and emails will open in other browsers, you do not have to worry about deleting IE! The only thing you will lose is any favourite you have set in IE. when i try to install IE10 why it says internet explorer 10 is already installed on this system. I have windows 10 and i disabled IE11 from turn windows features on and off. I have problems such as recover webpage, stop script and e-mail addresses not automatically storing plus a game of solitaire which after a while freezes the screen with IE not responding. I can’t decide if it’s IE11 or an adapter. I use the AOL webpage which probably doesn’t help but this has been going on ever since the upgrade to Win 8.1. Hoped that moving to Windows 10 would resolve things but it hasn’t. Nervous of deleting IE as have a lot of important documents and e-mails which I can’t afford to lose.